Active Element's Rinse Concentrate completes the dishwasher end cycle by removing water spots and residue leaving dishes with an even shine. 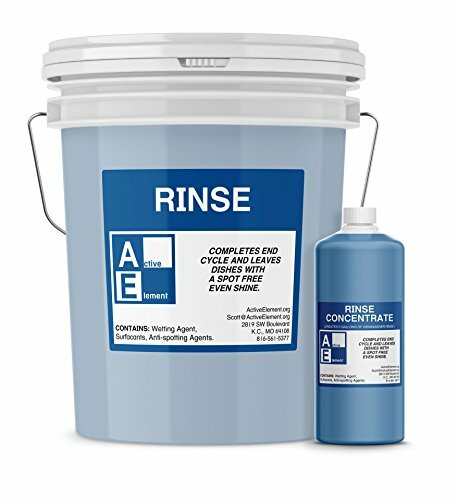 This commercial-grade rinse contains wetting agents and surfactants that speed up the drying process. Great for any food service kitchen including restaurants, diners, hotels, schools and not-for-profits.Intended for use in both high and low commercial dishwashers with water temperature above 140 degrees Fahrenheit. Shipped as a concentrate, each bottle is diluted with water to make 5-gallons of powerful rinse (Pail not included). Simply pour concentrate into empty 5-gallon pail. Fill pail with water. Apply label and ready for use. Completes the end cycle and removes water spots plus residue leaving dishes with and even shine. Commercial-Grade rinse for use in both high and low temperature machines. Contains wetting agents and surfactants that speed up the drying process. Sold as concentrate that makes 5-gallons of powerful rinse. Pail not included. Powerful cleaning meets cost effective and free nationwide shipping.